With Congress carefully watching the investigation into possible Russian interference in the 2016 United States presidential election, the international focus on Russia is strong. 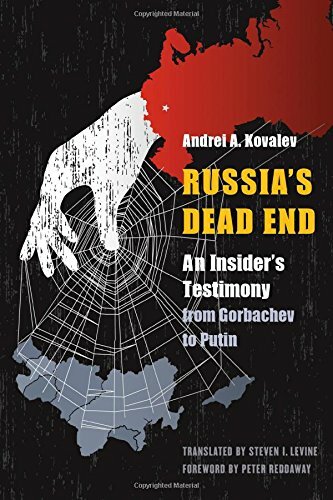 Andrei A. Kovalev’s book Russia’s Dead End couldn’t be timelier. Kovalev is a former insider, having served during the final years of the Soviet Union in the USSR Ministry of Foreign Affairs, and later in other prominent roles in Russia. He was a close associate of Mikhail Gorbachev, bringing him into close proximity with Soviet power brokers, right up through the end of the Soviet Union, and the beginnings of Glasnost, the fledgling effort to bring democracy to Russia. In his insider, no-holds-barred description of what happened, the author chronicles in detail the political maneuverings, missteps, betrayals, manipulations, and intrigues that were not obvious in the West, or even to Russian citizens themselves. Changes in governmental policies that had a direct bearing on the citizens often only occurred after much internecine battling behind the scenes of what had been one of the most secretive governments in the world. Those who had long held power in the Soviet Union were not willing to surrender it in Gorbachev’s new Russia. The names are not withheld; there is no “protecting of the innocent,” mainly, it seems, because Kovalev doesn’t see many innocents. He names names, focusing finally on current Russian President Vladimir Putin, of whom he is no fan. The author laments what he sees as Russia’s failed experiment in democracy; it was a nation, he suggests, that could have achieved much by now, but was anchored in the mire of past mistakes, and an Old Guard unwilling to change. He details where decisions that could have helped achieve noble goals were instead made to maintain people in their positions of power. Lessons for the U.S. in this book are clear. In Russia, “A rather narrow but powerful circle of ideologues vanquished history and established a monopoly over historical ‘truth’ or, more accurately, ‘pseudo truth.’” The “alternate facts” of the Trump Administration, and his contempt for what he calls “fake news,” appear to have precedence in Russian history. There are, today, many interpretations of Russia’s agenda as a player on the world stage. With the U.S. government in disarray under the stumbling leadership of Donald Trump, and with Trump’s history with Putin being closely scrutinized, Russia’s Dead End will make interesting reading for anyone seeking additional insights into that nation and its recent history. Whether one is pro- or anti-Russia, or supports or disdains Putin, this book will be a fascinating read. Robert Fantina is the author of Desertion and the American Soldier: 1776–2006, a history of military desertion from the U.S. revolution to the Iraqi war; Empire, Racism and Genocide: A History of U.S. Foreign Policy, and his most recent book is Essays on Palestine, a compilation of many of his articles on the brutal occupation of that nation. His articles on foreign policy, most frequently concerning Israel and Palestine, have appeared in such venues as Counterpunch, Mondoweiss and WarIsaCrime.org. He has lectured on U.S. violations of human rights in the U.S., Ireland, and Iran.